Current and future adaptation strategies will be crucial for the wine industry in the face of climate change, and effective action will require a combination of disciplines, technologies and approaches. This message recently brought 160 scientists from around the globe to the “ClimWine2016: Sustainable grape and wine production in the context of climate change” conference held in Bordeaux, France, with the shared aim of finding ways to combine their knowledge to understand and adapt to the impacts of climate change on the wine industry. One of the participants at the conference was Viticulture Lecturer Dr Amber Parker of Lincoln University, who is exploring changes to the lifecycle (phenology) of grapevines in response to temperature. She says earlier, compressed wine harvests and increased sugar concentration in grapes at harvest time are just two of the significant issues facing wine growers as grapevine phenology advances. “Solutions to adapt to current advances in grapevine phenology may include changing varieties or areas in which grapevines are planted, or using management techniques to delay ripening on existing vineyards,” says Dr Parker. Management techniques may include late pruning, canopy trimming or the application of plant growth regulators. Dr Parker has completed research investigating canopy trimming and yield manipulation. Her research on canopy trimming, carried out during her PhD under the supervision of Dr Mike Trought from Plant and Food Research, Dr Rainer Hofmann of Lincoln University, and Professor Cornelis van Leeuwen of Bordeaux Sciences Agro, was based on a case study of Pinot noir and Sauvignon blanc vines. Results showed that trimming shortly after the fruit set delayed the onset of ripening (véraison) for both varieties and slowed the rate of soluble solids accumulation. Véraison was up to a week later and caused a larger delay in the time of harvest (if harvesting on target sugars). Trimming at véraison also slowed sugar accumulation and delayed harvest but to a lesser degree. No differences were measured in the acidity of the grapes. Future studies will consider how canopy trimming affects the balance of sugar, acid concentration and other metabolites, and how this influences the final wine. The delays achieved by canopy management could be implemented as an adaptation practice to delay the harvest window and avoid ripening grapes in the warmer part of summer, which would have different consequences on the berry and wine composition than to maintain current timing of harvest. Since the completion of her PhD, Dr Parker was also involved in a three-year project led by Professor Andrew Sturman of Canterbury University (funded by the Ministry of Primary Industries) combining climate models and grapevine phenological models to characterise flowering of Sauvignon blanc in the Marlborough region. This was the first implementation in New Zealand of phenology models that Dr Parker has developed with European collaborators. Application so far has been to predict the timing of flowering of Sauvignon blanc in the different grape growing areas of the Marlborough. Phenological modelling research is of great interest internationally, and Dr Parker has ongoing involvement in international grapevine phenological modelling programmes. In particular, in the Northern Hemisphere, they are already recording advances in phenology and considering adaptation strategies as a result of observed increases in temperature. “If we can start to understand how much we can delay phenology via changing varieties or canopy management techniques then we can consider the best practice to negate the impact of increased temperatures due to climate change on the grapevine lifecycle. 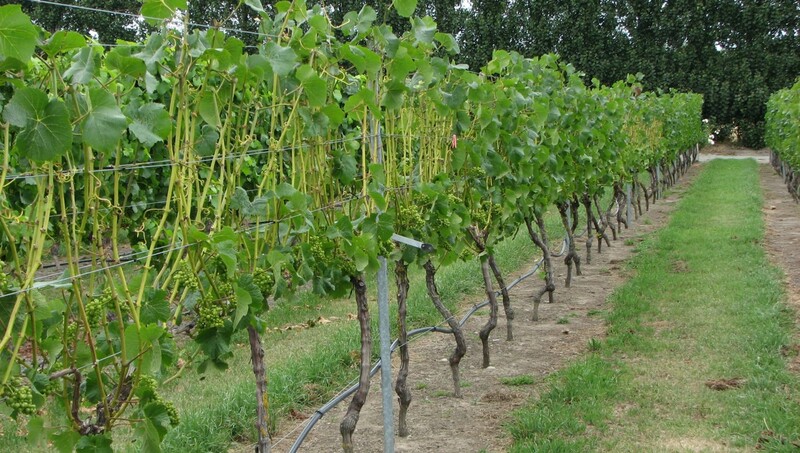 This will hopefully provide us with options in winegrowing regions in New Zealand and abroad to adapt to the climate of the future” said Dr Parker.